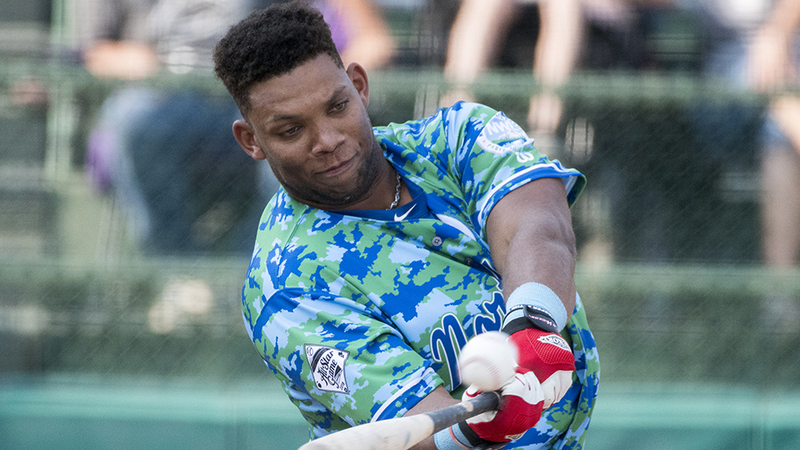 GRAND JUNCTION, Colo. -- With an overwhelming display of power, Northwest League home run leader Curtis Terry sent 14 balls over the walls at Suplizio Field to capture the Home Run Derby title at the Northwest-Pioneer League All-Star Game. The Spokane Indians first baseman needed only seven to take the crown over David Fry of the Helena Brewers, but he kept swinging for the full two minutes of the final round. "It's an honor to me, especially since this is my first All-Star Game," Terry said. "I'm going to enjoy it to the fullest. I'm just grateful to be out here. It's a great atmosphere and I'm loving it right now." Terry, who leads all Class A Short Season sluggers with 13 homers and a 1.030 OPS, started the contest with blasts in each of his first five swings in the opening round -- enough to tie or beat four of the other five competitors after they used the full two minutes. He finished the round with 12 for a derby total of 26. The Rangers prospect credits the work he did in extended spring training for the advances he's made this season. "We worked on how to hit breaking balls, how to lay off bad pitches. It's helped me this season a lot," he said. "That was fun, but now I gotta lock it in for the game." Fry, who has eight homers in 40 games this season and is among 15 Pioneer Leaguers with multi-homer games, knocked six in both rounds. Left-handed hitting Griffin Conine of the Vancouver Canadians started the derby with four roundtrippers. One of nine Northwest Leaguers with multi-homer games, the Blue Jays' 17th-ranked prospect has five jacks in 35 regular-season games. D-backs No. 15 prospect Andy Yerzy of the Hillsboro Hops had five first-round homers. Missoula Osprey catcher Zachery Almond, who shares the Pioneer League lead with nine homers, hit four out in the first round. Hometown favorite Coco Montes, who has seven homers for Grand Junction and leads the Pioneer League and all 2018 Draft picks with 108 total bases, belted three. Defending champion Daniel Jipping has returned to the All-Star Game with the Boise Hawks but is unable to compete due to injury. He slugged his seventh homer of the season on Saturday off fellow All-Star Jheyson Caraballo of the Everett AquaSox, then fractured a toe when he was hit by a pitch in the ninth inning.